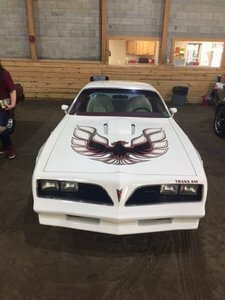 This 1979 Real Deal Pontiac Trans Am definitely has the look! Its powered by its W code 301 4V V8 engine and backed an automatic transmission. It comes equipped with power steering power front disk brakes factory air car ken wood CD player T tops Dual exhaust with correct tips and is riding on a set of TA wheels with BFG RWL tires. Its code 77 Carmine Metallic paint has a good shine and i would classify it as a 20 footer. Its original red interior is presentable for a driver but is showing its age. Its floors frame and trunk floor are real solid and clean. This is real solid and great looking trans am that has the look! Visit Coyote Classics online at coyoteclassics.com to see more pictures of this vehicle or call us at 641-512-4727 today to schedule your test drive.